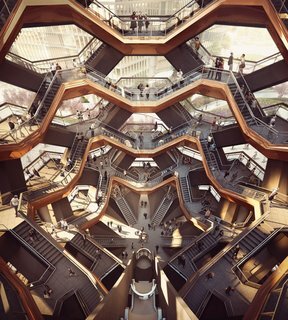 Destined as the centerpiece of the Public Square in New York City's Hudson Yards—allegedly the biggest private real estate project in American history to date—the structure is the focal point within more than five acres of plazas and gardens designed by landscape architect Thomas Woltz. 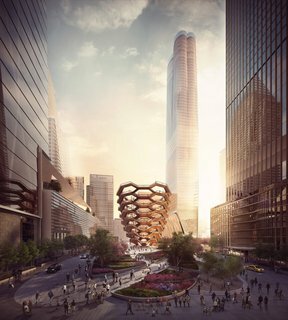 Vessel is a recent addition to the growing collection of new landmarks in New York, including Santiago Calatrava's Oculus at the World Trade Center, the World Trade Center Memorial Fountain, and the High Line elevated park on formerly abandoned train tracks. 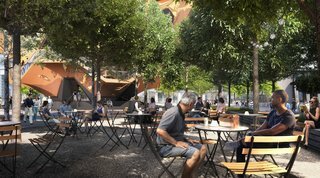 It will function as an exclamation point toward the northern end of the High Line, attracting visitors to the otherwise hard-to-reach location. Envisioned as a new kind of public landmark, it is intentionally designed to be engaging and interactive — and in this case, climbed and explored. The structure is encompassed in a mile’s worth of pathway leading toward the sky, comprised of 154 intricately interconnecting flights of stairs, with almost 2,500 individual steps, and 80 landings. "It will lift the public up," says Heatherwick Studio, raising people significantly above ground level so they can see the city — and one another — in a new way. As the story goes, Vessel was influenced by Indian stepwells, made from hundreds of flights of stairs going down into the ground. The design brings to mind M.C. Escher’s endless staircase, encapsulating a geometric lattice of intersecting flights of stairs. Taking the form of a conical shape, it rises from a 50-foot diameter base that that widens at the top to 150 feet. The formation is supported by a structural painted steel frame outfitted with underside surfaces clad in a polished copper-colored steel skin, which will provide warped reflections of the plaza below. Envisioned as a new kind of public landmark, it's intentionally designed to be engaging and interactive—and in this case, climbed and explored. The structure is encompassed in a mile’s worth of path ways leading toward the sky, comprised of 154 interconnecting flights of stairs, with almost 2,500 individual steps and 80 landings. 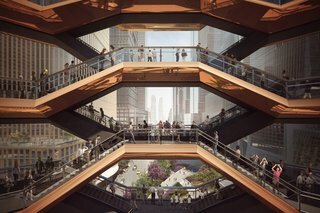 "It will lift the public up," says Heatherwick Studio, raising people significantly above ground level so they can see the city—and one another—in a new way. As the story goes, Vessel was influenced by Indian stepwells, made from hundreds of flights of stairs descending into the ground. The design brings to mind M.C. Escher’s endless staircase, encapsulating a geometric lattice of intersecting flights of stairs. Taking the form of a conical shape, it rises from a 50-foot-diameter base that widens at the top to 150 feet. The formation is supported by a structural painted-steel frame that's outfitted with underside surfaces clad in a polished copper-colored steel skin, which will provide warped reflections of the plaza below. Set to be completed in Fall 2018, the project broke ground on April 18 as part of Hudson Yards’ eastern section alongside eight buildings comprising office space, retail outlets, residences and a new cultural institution, the Shed.